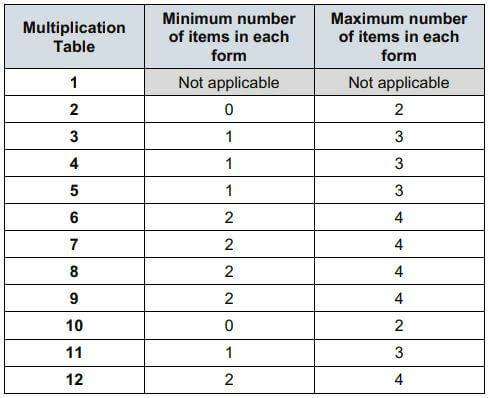 The Key Stage 2 multiplication tables check (MTC) assessment framework has been published (here)! We’ve worked our way through the document and now know what the check is going to be like. So the MTC will be an online check in a three week period June each year for pupils in year 4. Schools can decide when their pupils will sit the check. The school can also decide on what device type – tablet or computer (no paper option). The MTC will be different for each and every child as the test features a set of 25 generated times tables questions. Pupils will have 6 seconds to read the question, understand it, and enter a response. They will then receive a 3 second pause before the next question is shown. Questions will be made up from the 2-12 multiplication tables. The table shown here gives the maximum and minimum number of questions that will be presented to the pupils. Please remember that these checks will only become compulsory from June 2020. So that means your current year 3 students will be expected to undertake the check. Schools are free to volunteer in 2019 and the check will be available between 10-28 June. Any school that wants to be part of the check in 2019 needs to have their pupil registration data correct on NCA tools on 1st April 2019. The results will not form part of the league tables but Ofsted will have access and they will more than likely come up during an Ofsted inspection in a similar way to phonics checks. Times tables with Emile will feature a MTC prep test mode from 1st December 2018. Set in accordance with all we know about the official check, regular use of Times Table with Emile will deliver excellent preparation for pupils and teachers.